On Thursday, when I drove out to see my mother, it was a beautiful day, I thought possibly one of the last unseasonably warm days of October. While the trees in the city are barely registering autumn's existence, I spotted some orange and gold amidst the greens as I wound my way through the island, and the idea dropped into my brain: why not take Mom out for a drive? Since her fall in May, the only time she's been outside has been when she's being transferred between facilities or for brief wheels around the courtyards of the nursing home. At first Mom was in too much pain to contemplate transferring her into the car, and then there was the next fall in August. But it's been a while since then, and I'd been mulling over what I could do to lift her spirits mightily and there was nothing I could think of that would do that better than a foray into the world. Upon arrival at the home, I proposed it to the unit charge nurse and she saw nothing to stop us, so she dug out the paperwork and plans were set in motion. There were a few kinks to work out, so by the time we left it was approaching lunchtime. Then I got really ambitious. While I'd initially been thinking: half hour drive and right back home, I decided to try taking her out to lunch as well. Mom has been losing weight, her appetite diminished down to near nothing. Mostly it's depression, but some of it has to be the monotony of the food; hospital or nursing home it's all the same bland stuff. So into the car Mom went. (The car that used to be hers.) A few minutes into the drive I realized two things: that her hearing aid battery was absolutely dead, and her morning Tylenol dose had worn off, so the bumps and bobbles of the road were causing her enough discomfort to be distracting. A stop at the local Rite Aid remedied these issues and the drive continued. I also handed her a lovely mini blueberry scone (from Alice's Teacup) that I'd snagged at the PA meeting I had attended that morning before trekking out to the island. We toured the roads of Port Washington and Sands Point. I drove her by the big fancy houses nested along the shore. We caught a few glimpses of beach and the Sound, where it opened up to the most expansive vista she's enjoyed in months. Every turning tree, every still blossoming garden elicited her enthusiastic appreciation: "Oh, how beautiful." or "Just look at those leaves!" After about a half hour I was getting hungry and so steered us into town. Port Washington is a really special place to me. Not the town I grew up in, but the town of my cousins. It's a place with a personality, a center; not a suburban-nowhere. And I've been spending time there for nearly half a century. I knew we could get a good meal in the lovely little downtown and in a fit of inspiration I chose Japanese. My parents had loved Japanese food, especially my father who thought a good bowl of nabeyaki udon was something approaching perfection. Wherever they lived, they had a local Japanese restaurant they frequented on a weekly basis, befriended the owners, became "the regulars." And now it had literally been years since Mom had eaten Japanese. I remedied that on Thursday. The place was near empty, which worked for us. I ordered the salmon teriyaki lunch special for my mother. And she ate with gusto. She ate the Whole. Damn. Thing. So much for the lack of appetite. It was a lovely lunch. I had set Mom up with a view of the large tank of koi goldfish, living things always pleasing her so. It was good for her to be out in the world, good for me to be with her, in the world. There was a part of me, of course, that didn't want to turn into the home as we approached; that wanted to keep going, to drive and drive, kidnap mom, ride off into the sunset with her, feed her all kinds of interesting foods, show her as much of the world as we can see for as long as she can keep going, a Thelma and Louise style road trip (minus the violence and the cliff and all, though). But of course I didn't. There were some little people who would be very hurt and disappointed if their mom didn't come home at the end of the day. A breeze was picking up as I pulled into the circular drive, the leaves all waving goodbye as I wheeled Mom back inside. There was a bit more sparkle in her eye as I kissed her goodbye, squeezed her hand, promising, as always, to return within a few days. What shall we eat next, when I do? I did the same thing on Saturday, Varda! How my mother loved it. I took her to Goodwill, which she loves to spend hours in. She loves to look at all the dinnerware, plaques, pictures and reminisce. Then we went for custard and a drive along the lake. We took her back home when it was dark and she almost had tears in her eyes from the loveliness of the day. Varda, this just made me smile so much. Every description was just perfect. I'm so glad you got to share such a lovely day together! I cried a bit. I'm not sure why. You need to write a book, if you're not doing so already. I am so in awe of the love you have for your mother (I remember you reading at BlogHer). I know to you it probably seems normal to show your love in so many ways, but it's a challenge to me to be better. Aw, how sweet of you. It's hard to see your parents get older, I imagine. A bittersweet day. What a wonderful day you had with your Mom; The perfect gift! I hope you have many more days like that! Oh Varda, I do hope you continue to have lunch dates with her! For the both of you. Memories of luncheons with your mom... That sounds lovely. perhaps it's because this post reminded me of my ailing 89 year old (maternal) grandmother who is wasting away to nothing... perhaps it's the reminder that i need to call my 79 year old father who lives alone in a retirement community... whatever it is, i'm left with tears in my eyes. you're a good egg and i can't wait to hear where you and your moms next adventure will take you. Oh, Varda. I saw the lovely picture of your mother on Instagram and I almost cried because she looks so much like my nana. Then to come to this post with the ride around Port Washington and Sands Point, where I spent many sunny days driving around during my childhood and teenage years...you've brought me to tears! What a lovely, lovely thing to do. I wish I had done more of that with my Dad, just the two of us, before he passed. This is lovely. Glad you had such a special day with your mom. What a wonderful, wonderful day for both of you! I remember the days when my grandmother was able to leave the home -- I don't know who was more excited, her or me! Thank you for such a gentle, loving read. Sounds like it was a fun adventure and a great memory with your mom. In three weeks, my mom will be seventy. I've been having a lot of bittersweet moments because I remember how vibrant she was with my twenty year old daughter, taking care of her, watching her all the time. Now with my 8 month old, she is too fearful of falling with him to hold him much. And I fear when it is time to put her someplace that can take care of her when she can no longer take care of herself. But your post reminded me that even though the locations may change, the relationship doesn't. "There was a part of me, of course, that didn't want to turn into the home as we approached; that wanted to keep going, to drive and drive..."
As always, the love is palpable. Thank you for sharing some of it with us. 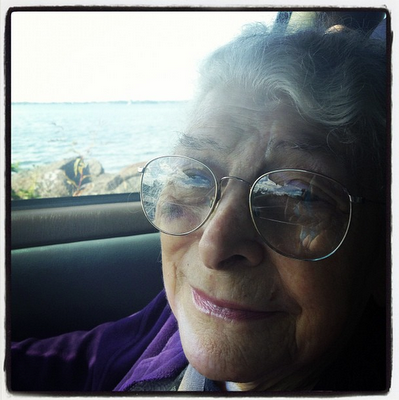 Your post was beautiful, and the love you share with your Mom brings tears to my eyes. That must have been an incredibly special day and I wish you both many more of them! Aww, I feel all melty inside. How special of a day, memorable, for you both! I am so happy for both of you that you managed to call this spectacular day into existence and celebrate it so fully. Funny how things we did "all the time" can slip away till, much to our chagrin, we haven't done them in years. 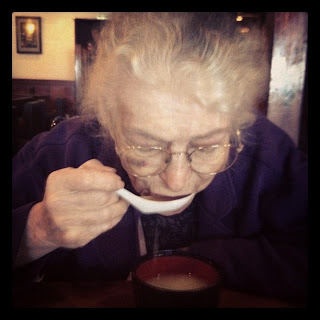 By taking her out for Japanese, you let her be her younger self. A wonderful mitzvah. What a wonderful thing you were able to do for your mother. My mother hated the food in her nursing home and she loved when we'd get her Italian take out (she couldn't leave the home, unfortunately). I'm sure that lifted her spirits so much! This is such a lovely post. I can only imagine how bland hospital/nursing home food must taste to the elderly. Varda, this was a wonderful, wonderful story. And the pictures were perfect. I wish you could have Thelma and Louised it a while, too! I vote Middle Eastern and I hope I get to hear more about the adventures of the two of you (I especially loved that you took her to one of their old stomping grounds). This is so very beautiful. I'm glad you both had such a lovely day and she found her appetite at your special lunch. If I get a vote, I'd go for Indian next time y'all are out. This made me sad thinking of how even simple pleasures can be taken from us as we age. What a loving gift you gave your mom in a beautiful fall drive and her favourite kind of lunch. So sweet, it brought back lovely memories of my grandmother. Simple pleasures indeed. And I hope you can bring her foods even when you can't come.